Architecture is a field that is extremely competitive, but can be very rewarding for individuals that become architects. There are many different types of architectural specialties, but most architects start out in the same way. If you are interested in becoming an architect, here is a guide to get you started. So, what does an architect really do? An architect is a licensed professional who designs how space is used. Architects can work with a wide range of spaces – both public and private. An architect is employed to design homes, office buildings, commercial spaces; there are even architects that specialize in creating the layout of the interior of ships. During the course of their daily work, architects need to create space that will fit their clients’ needs. But they also need to make sure that the completed construction stays on budget and follows local building codes, zoning laws, fire regulations, and other regulations. 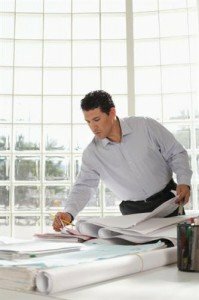 Architects need to be licensed, that means they need to go through a professional program to develop the skills necessary to pass licensing exams and fulfill the licensing requirements. Each jurisdiction in the United States is responsible for setting their own requirements for becoming licensed. Minimum licensing requirements are standardized through the National Council of Architectural Registration Boards (NCARB) and this is the organization that is resonisble for overseeng any licensing disputes that occur. There are 113 colleges and universities in the US that are accredited by the National Architectural Accrediting Board (NAAB) to offer architectural studies programs to students. These schools all offer a four-year architectual degree which is just the first step on the long journey to becoming a practicing architect. After a person graduates from an accredited architectural program, he must receive hands-on training and additional experiences before taking the licensing exam. This hands-on experience must to be arranged though the Intern Development Program (IDP). In the IDP, the future architect will work on real life projects with professional architects who act as mentors who can guide him and help him develop a portfolio of professional projects. These types of internships last from between one and five years. After the successful completion of the internship, the candidate is ready to take the Architect Resigteration Exam. What is the job outlook for architects? Generally, the job outlook for architects is good, according to the US Bureau of Labor Statististics (BLS). From 2010 to 2020 there the BLS predicts an 24% increase in the number of jobs in the architectual field. As the public buildings age, the BLS predicts that there will be a need to remodel these outdated structures and design new public buildings. A new trend of ‘green’ archecture means that specialists in ecological and archecticure should have an expanded market. While the number of jobs are predicted to increase in the coming year, the competition for these jobs will be stiff. There is an increased number of students recently graduating from archetectural programs who are looking for work. Many new architects may find themselves with long periods of unemployment, especially as they begin their careers. What is the salary of the starting architect? While there are many factors that determine the starting salary of any job, the average salary of all architects was $72,550 in May of 2010, according to the BLS. The lowest 10% of architects made less than $42,860 an the highest 10% made over $119,500. The average starting salary in 2011 was between $34,209 and $45,348. If you are interested in a career in architecture there are many other career paths that are related. You may want to check out these other careers: Civil Engineers, Interior Designers, Industrial Designers, Landscape Architects or Urban and Regional Planners.